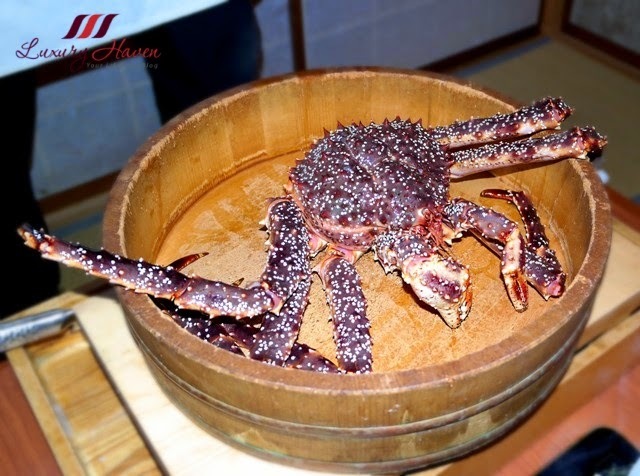 Akasaka Kitafuku Red King Crab Dining Adventure ( 赤坂きた福 )! 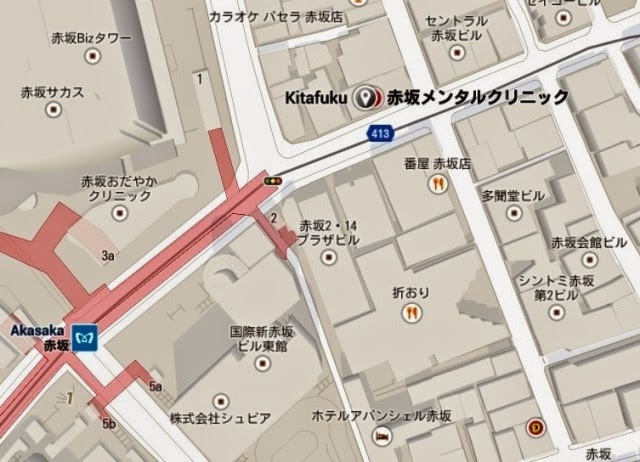 You are here:Home » Travel » Akasaka Kitafuku Red King Crab Dining Adventure ( 赤坂きた福 )! Are you a crab lover like me? 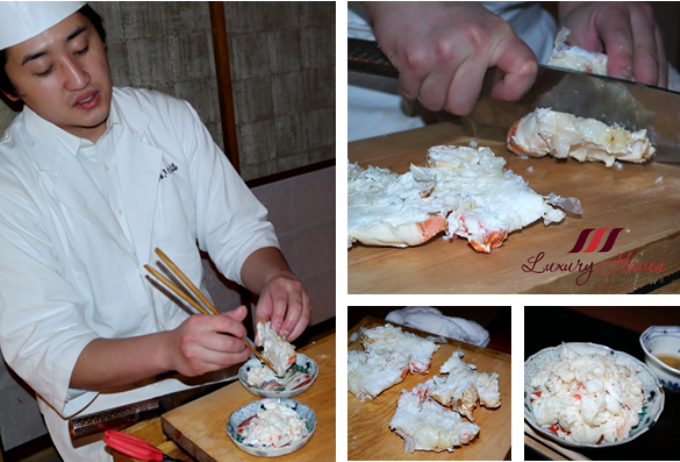 Have you ever had a feast solely on savouring different parts of a huge Red King Crab? Red King Crab or otherwise known as Paralithodes Camtschaticus, is the largest and most common species of the Alaskan king crab species. This King Crab is the most prized species of crab in the world, with strong demand from consumers in Japan, the US and Europe. 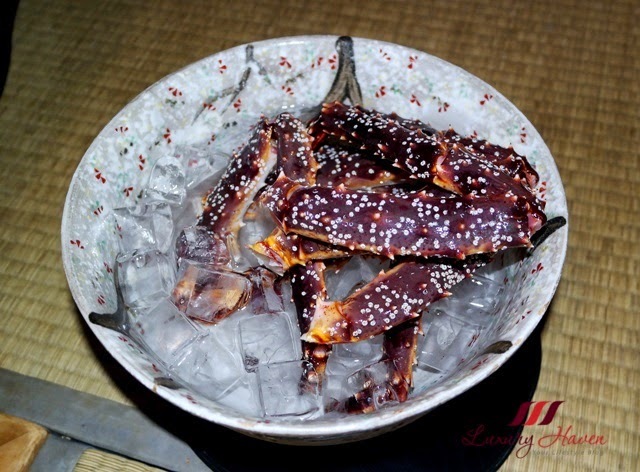 In Japanese, the Red King Crab is called Tarabagani ( タラバガニ ), and Akasaka Kitafuku ( 赤坂きた福 ) is a Michelin-starred restaurant specialized in serving these most sought after delicacies. 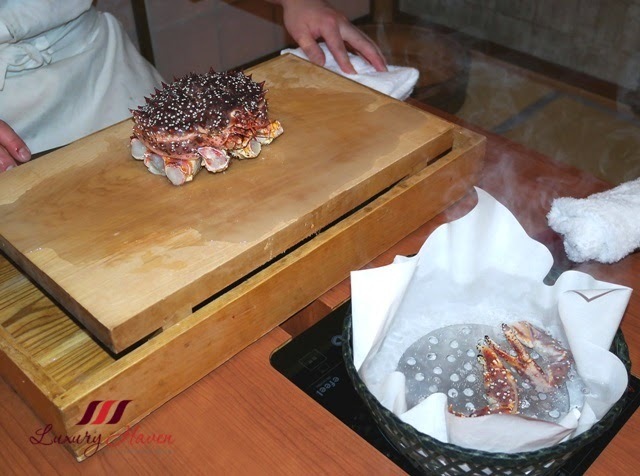 At Akasaka Kitafuku Red King Crab Restaurant, the crabs are directly fished out of the tank, and cooked right before your eyes in a pleasant traditional Japanese style private room. There are various dinner menus, and my Japanese friend and I picked the Abalone and Red King Crab Course ( あわびと活たらば蟹のコース ）at ¥27,000 per pax (approx USD 226) excluding service charge and taxes. Get ready to salivate! 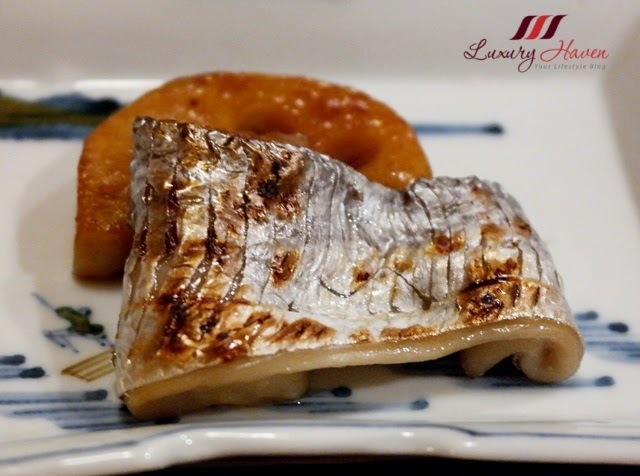 Grilled Scabbard Fish ( 太刀魚焼 ). 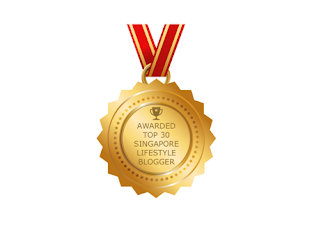 If you have been following my blog, you would have known I'm not a fan of fish especially those that come with skin. 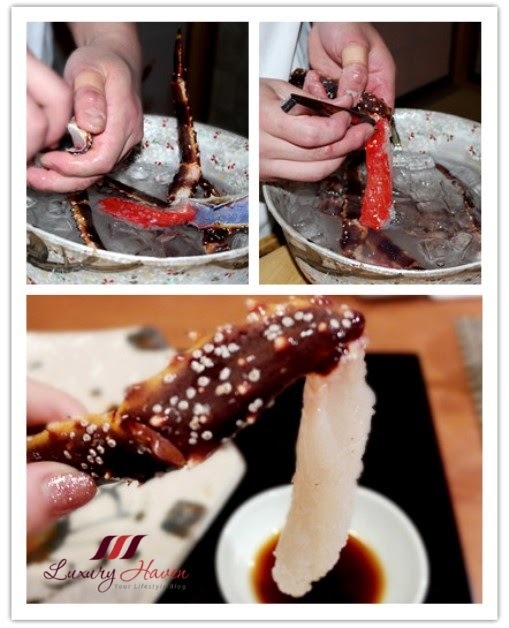 I can't comment on these two dishes since I had surrendered them to my Japanese friend. 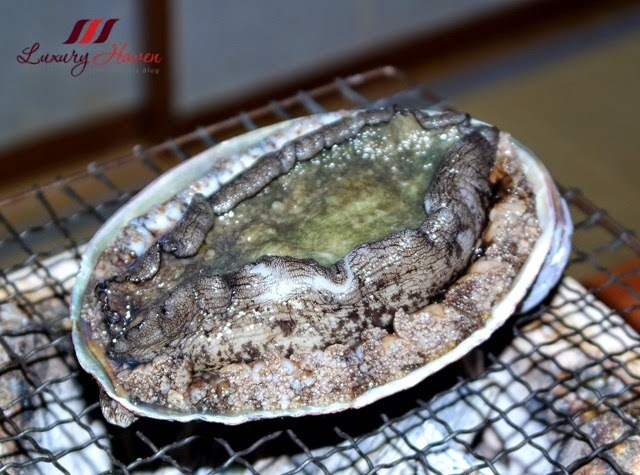 Next came the monster-sized Abalone ( 鮑 ) and it's alive! Wanna know how big it is exactly? I put my palm above it to give you a rough estimate of the size. Huge, right? It was probably the biggest abalone I have tried to date! I could see the shellfish wriggling while on the grill; not a charming sight at all. Lol! 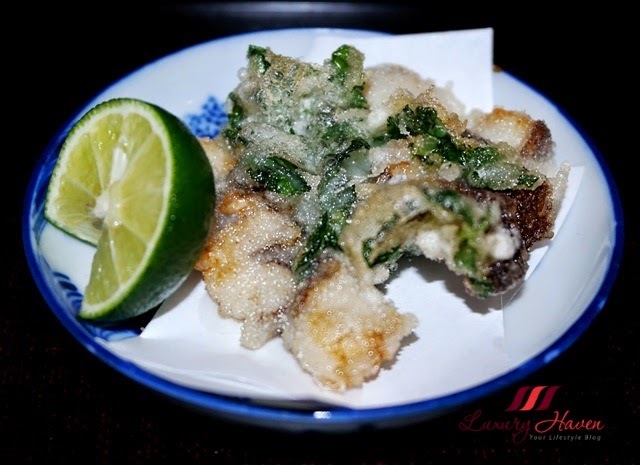 The abalone was done in two ways - grilled and tempura style. I am a huge fan of abalone especially done Chinese style, but after this meal, I have double and triple confirmed that I don't fancy the Japanese style of cooking abalone. My last few experiences with abalone sashimi and grilled abalone weren't very pleasant either cause they tend to have a very fishy taste. This was worse! 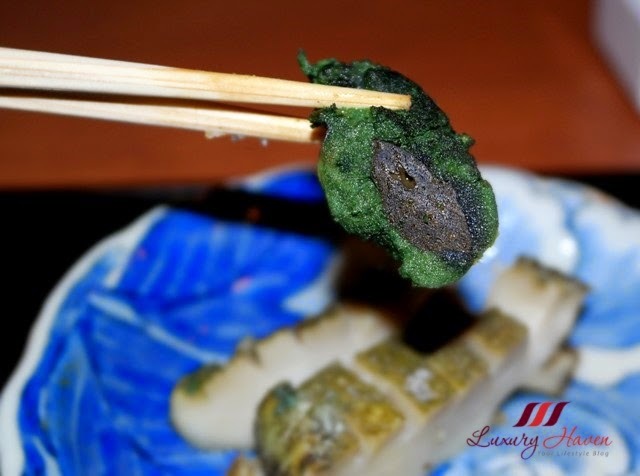 The greeny stuff is actually the Abalone Liver ( 鮑肝). Honestly, it was my first time seeing Awabi Kimo although I eat abalone rather often. Appreciated as a delicacy and probably a gem to many others, I only took a tiny bite and gave up! It has a very earthy and fishy taste, and I guess it is an acquired taste. Well, the colour puts me off too. While we were busy chatting and discussing our dishes, the chef left the room. We were surprised when he returned with the king crab, for we certainly did not expect such a huge one for just two people. From here, we witnessed the Red King Crab alive, and slowly being chopped up part by part, with the chef putting the two pincers into a pot of boiling water while two legs went into an ice water bath. At the same time, the chef removed the shells and put another two legs onto a charcoal grill. 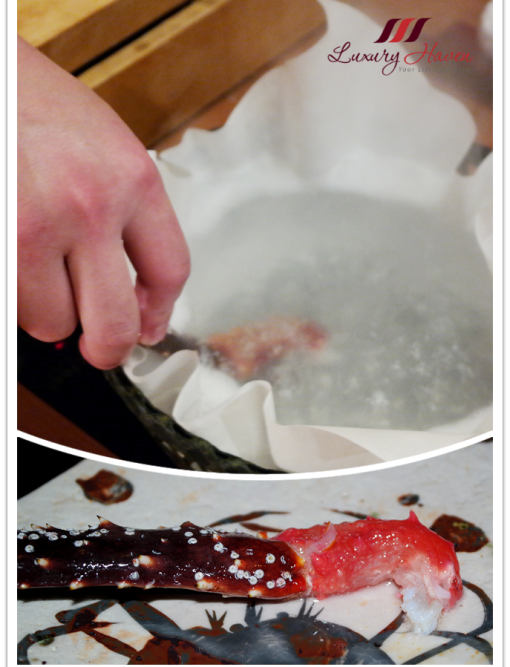 Our actual King Crab feast began with Sashimi Tarabagani after removing the chilled flesh from the icy water. The meat was very fresh and refreshing, and we were given a light soya dipping sauce to pair with. The fleshy meat was sweet with delicate flavours, and it was tasty enough to go without any sauce. Next was Tarabagani Shabu Shabu where the meat was parboiled. 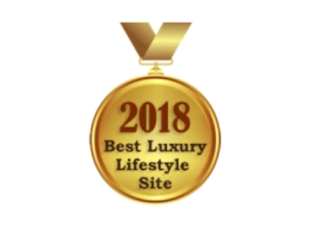 The texture of the flesh was a cross between sashimi style and a fully cooked one; it was soft and tender, retaining most of its natural juices. Remember the two pincers that were left in the boiling water earlier? They were finally cooked and served. Yummy! These Grilled Tarabagani were bbq to perfection with meat still juicy and succulent. 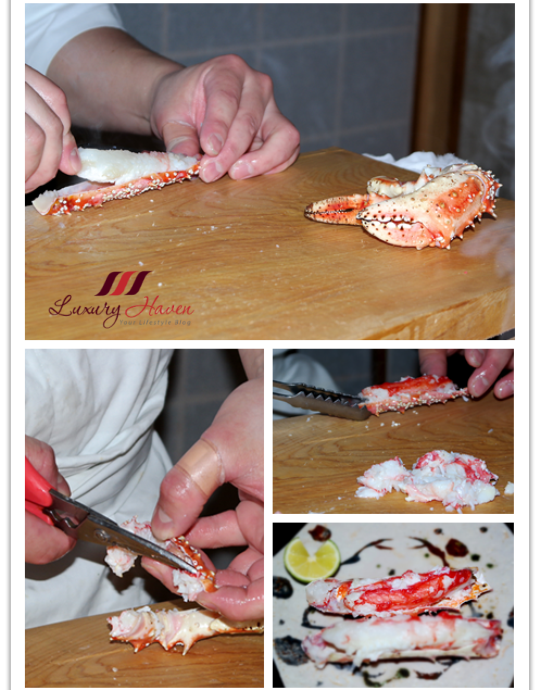 After the chef had taken care of all the legs, he moved on to remove the carapace. Almost all parts of the Red King Crab are edible except for the carapace which is the King's Crown. Look at the vibrant colour of the fresh kani! He continued to remove the heart, the skin etc and put them all onto a serving plate. It was an eye-opening experience for me since most of the time, crab innards are rarely served. Over at Akasaka Kitafuku, you will get the rare parts of the delicious crab that only highly skilled chefs can serve you. By that time, my friend and I were already almost full; couldn't believe there were more to go. The chef moved on to scrap off the remaining meat and there was quite a lot actually. 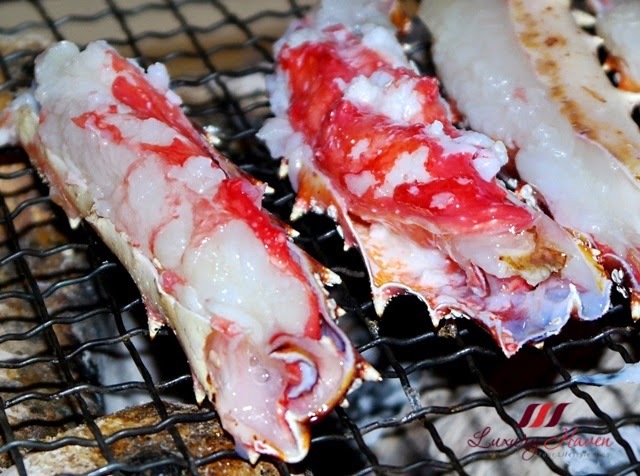 Tarabagani is regarded as the premium of king crabs because its meat is moist and sweet. 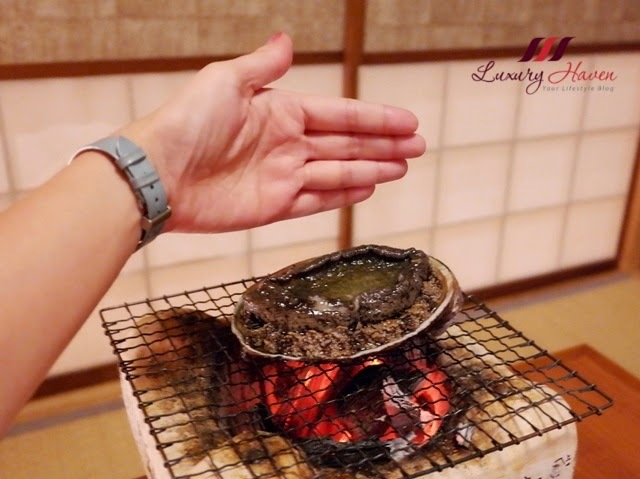 For this Abalone and Red King Crab Course ( あわびと活たらば蟹のコース ）at ¥27,000 per pax, diners will get a full course of red king crab dishes + abalone, and traditionally pod cooked rice with authentic miso soup, desserts. Just look at the generous bowl of salmon roe! The entire dining experience took about 3 hours+, where you will get to see the artistic performance of the restaurant's chef cooking the massive crab alive in front of you. 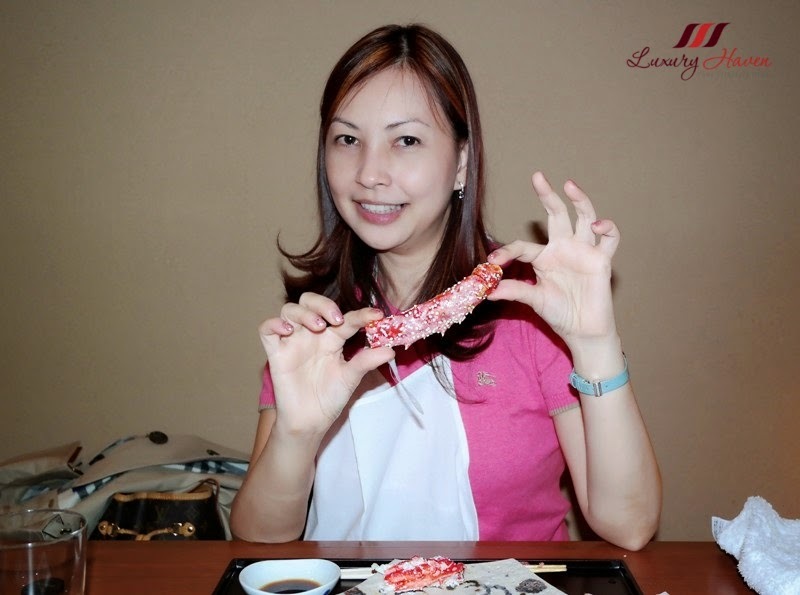 You will get to savour mouth-watering crab cuisine that comes with an unforgettable dining experience. It was the limitless variety that keeps our palates curious and clamouring for more. 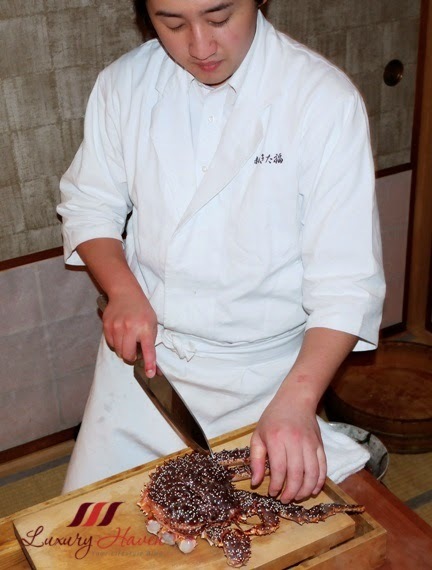 Each step at Akasaka Kitafuku is a unique tasting treat, a synthesis of the vast experience. 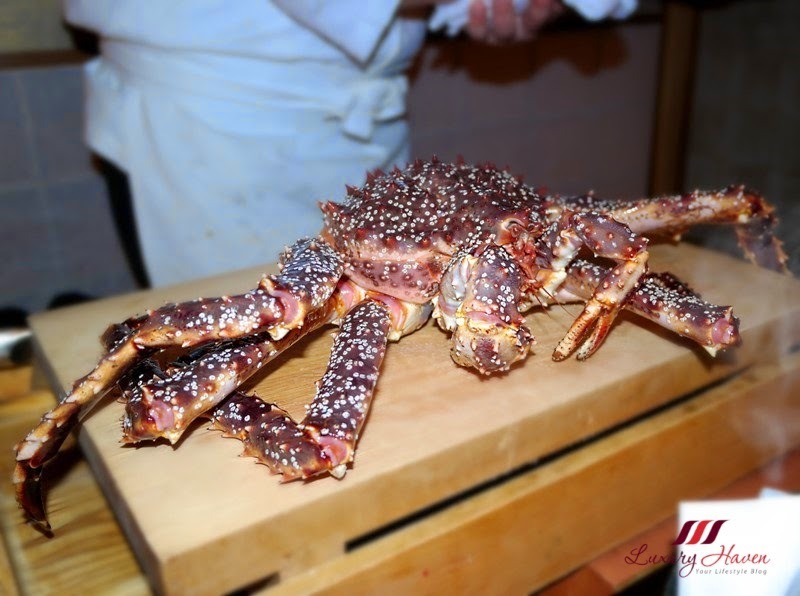 Do you know that the largest King Crab can grow a leg span of 6 feet across and weigh over 20 pounds? 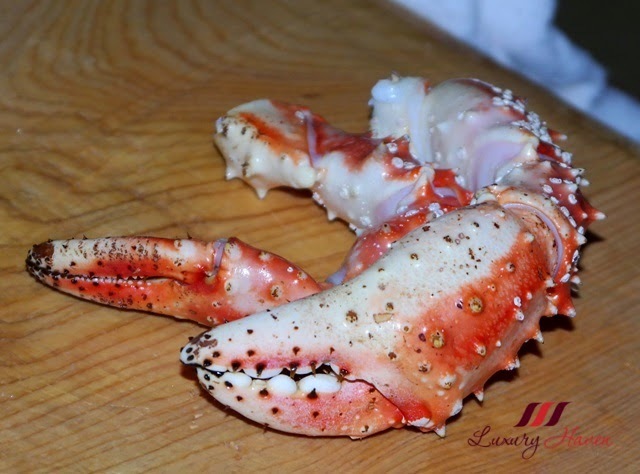 Have you ever had a date with the Red King Crab? 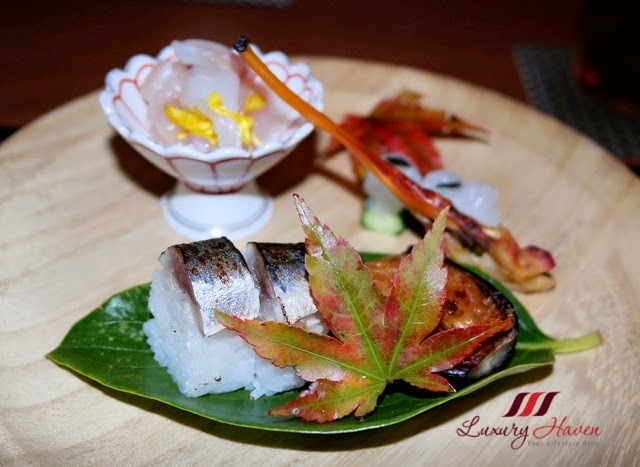 Reservation at the Japanese restaurant is a must, and be sure you book weeks ahead! 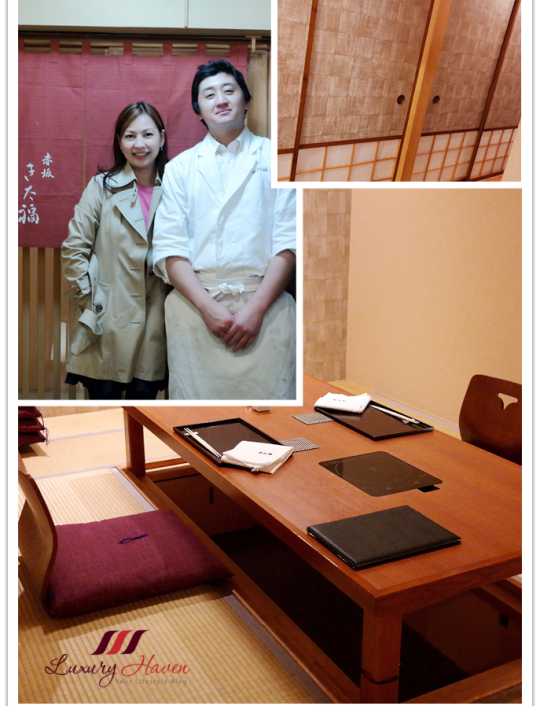 Well, the small dining eatery only has 3 private rooms good for a party of 2 to 6 to get the best experience. Ohhh!!! Bring backs memories of my trip to Hokkaido. Had all those dishes continuously for a few days until I couldn't eat anymore and eat Maggi cup. The crabs are really fresh. Quite nice but couldn't eat the abalone. You're so cute, Nava! Reminds me of my last trip to Hokkaido too. Gosh, all those crabs! What an indulgence Shirley! The Japanese sure know how to cook their crabs well! Yummy Yummy, It looks delicious. So tasty and amazing pics!!!! I just had crab and tilefish in Hilton Head, South Carolina, when I was on vacation. It was delicious! Great pictures! That is one incredible seafood feast Shirley! My husband is allergic to shellfish so I don't eat crab for team support but to be honest I don't really like it much. What a great live performance!!! How cool to go to a crab feast I really do not eat crab so will never attend to the feast. Oh this food looks amazing! It s really interesting to seethe preparations of this dish, and i really love crumb. That crab sounds amazing...such a feast! The fish looks delicious, I would be happy to be in the place of the friend you gave that dish to. I have always loved fish...thanks for sharing...everything looks yummy. Oh, that will be nice! I would be most happy to pass the fish all to you. Hahaha! Lovely photos, Shirley! Wow! 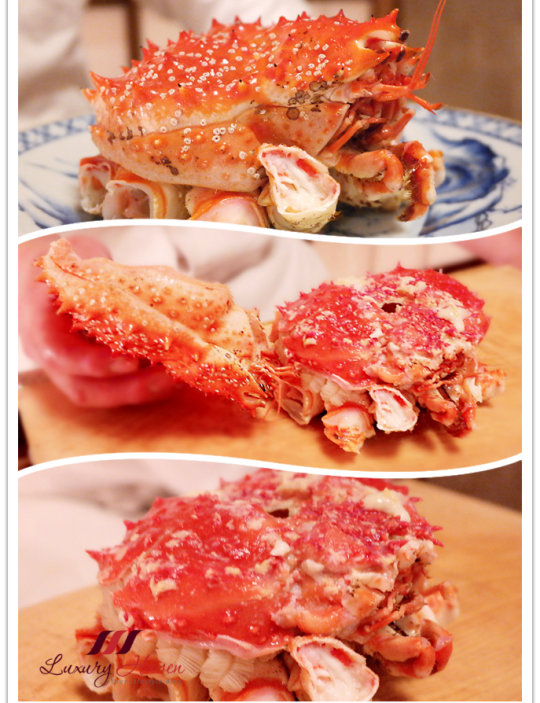 It's amazing, the king crab!!! 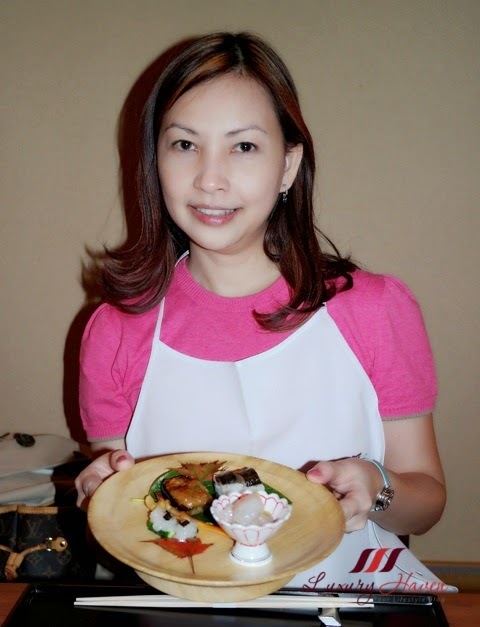 You had an amazing meal, Shirely and, I am thrilled you shared it with us...Thanks! Oh yes, my family loves watching Deadliest Catch too! We used to follow the series when it went on air some years back. We were surprised with the hardwork behind not forgetting braving the storms etc. I wouldn't want to be on the boat, would you? Hahaha! Yap, I would too & it would be great to be on the boat together with you. I can imagine the gluttons travelling together. Lol! yum that looks absolutely delicious! i just had lobster recently and now you're making me crave it again! 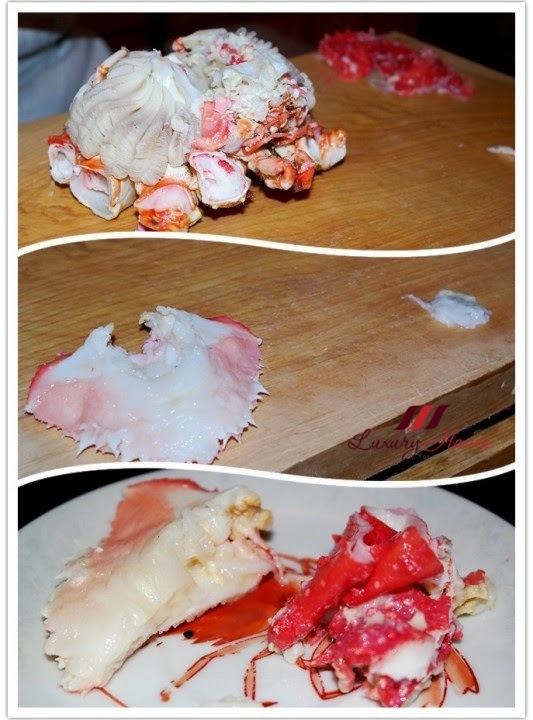 I love crab, I would really love to try this!! 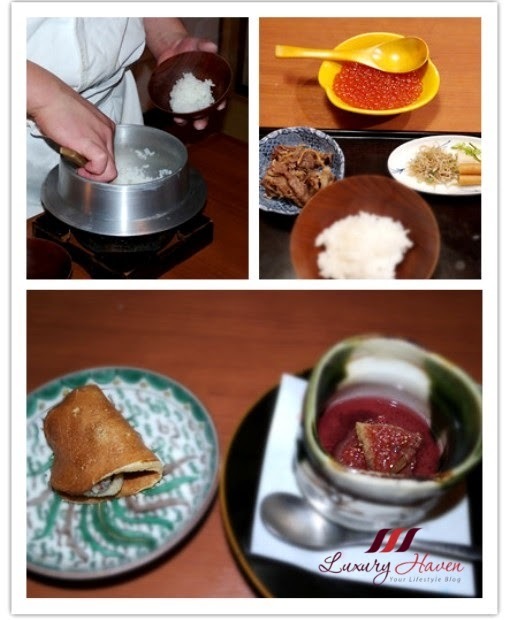 good food ... oh yes with a hot sake..
Wow looks so delicious Shirley. Your post is killing me:). I love red king crab. Yummy:). Have a great weekend to you:). 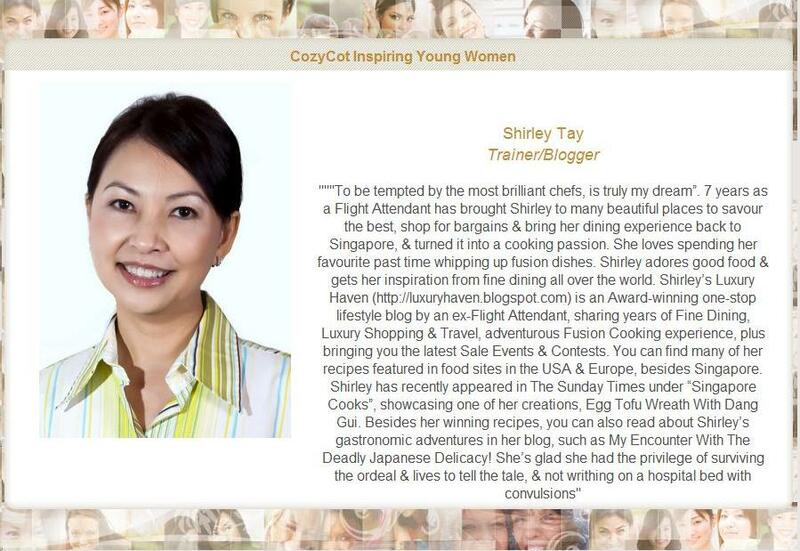 These are lovely dish Shirley, im literally drooling right now reading this post! How i miss easting crabs, its been a while. I have never eaten crab before but this one is tempting. A yummy dish, no doubt ! Thank you, Shirley for introducing such wonderful delicacies to us. I agree with you the entire cooking process is like an art. 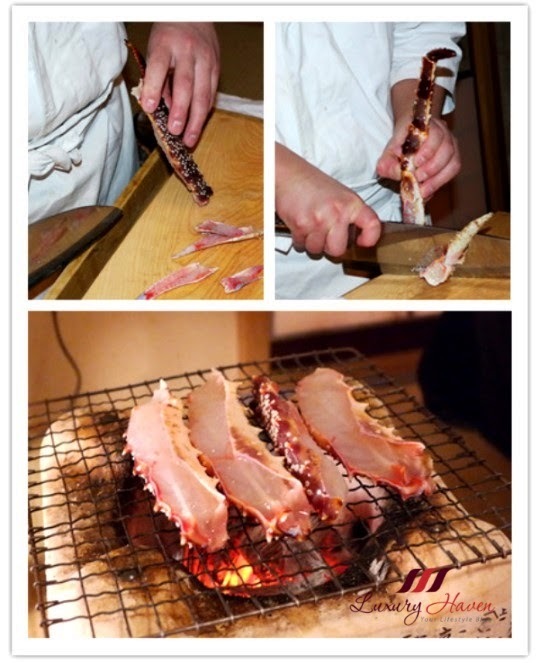 I want to try the abalone liver after you have described it. 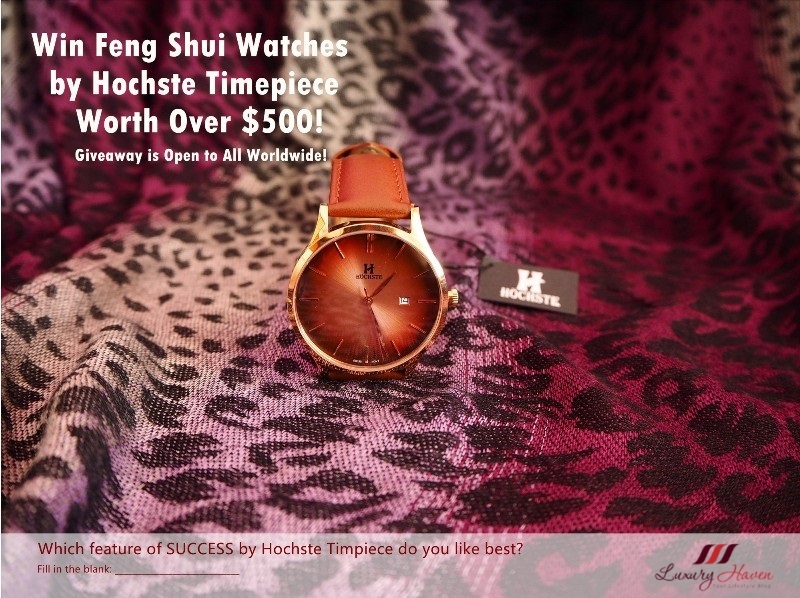 Guess I must start saving for it as it is almost one thousand ringgit here. 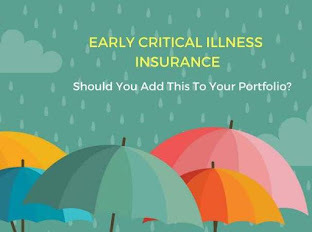 Is this course available all year round or seasonal? I'm a huge fan of crab, too. 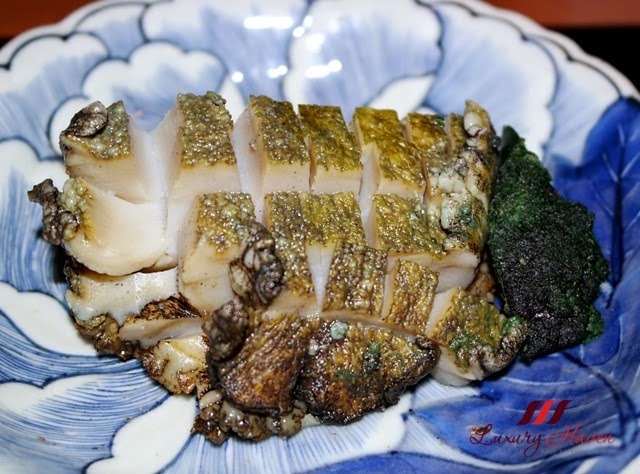 I don't think I've ever had abalone, but I would have passed on the liver, too! Sadly, not hungry at all. I hate seafood but this must have been very enjoying to watch and consume quickly after. That's really a huge crab! Good to know that every parts are fully utilised and serve deliciously. 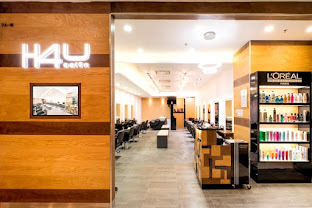 Hi, they serve you one crab for you n your friend to share? Not one crab per person? Hi was the price per person and is it a whole king crab for each person? 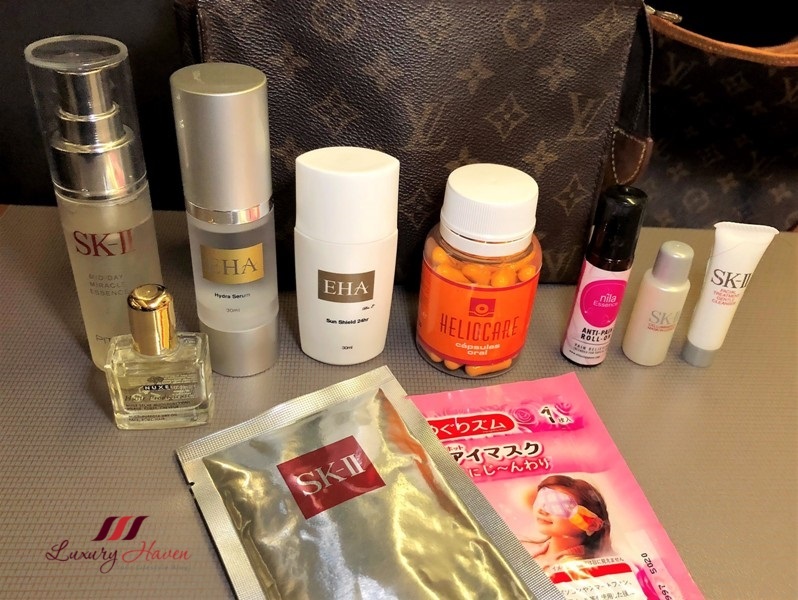 "¥27,000 per pax (approx USD 226) excluding service charge and taxes." Hope this clarifies. Happy weekend! Hahaha! You're right, Daniel. Why haven't I thought of that? Mmm.... maybe they go by size? Thanks for coming by & sharing your thoughts with us here! 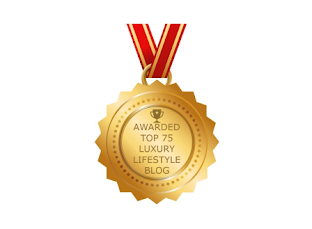 Nice having you & do subscribe via email to receive our juicy news! 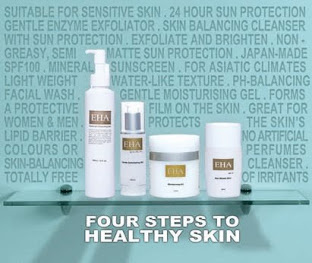 If you're residing in SG, join our latest giveaway to Win an Exfoliator Worth $68! We've 10 bottles to go!